Dudes, Duddetes.. this is Mike what is up, today I’m going to show you the best ice hockey helmets of 2019, but also the most protective helmets because that’s what we’re all about here. I was sitting by my local ice rink speaking to a bunch of the guys who mentioned that there are much lower concussions in the NHL compared to NFL. I found this quite interesting and thought I would do a little more research into the reasons for that. Also I’m going to tell you what you need to know about helmets when it comes to rules of official games, leagues and safety. If you want to see anymore of our awesome valuable content check out the home page for some more reviews which includes our list of 10 weird hockey skates that will improve your edge control and acceleration which has been so popular. 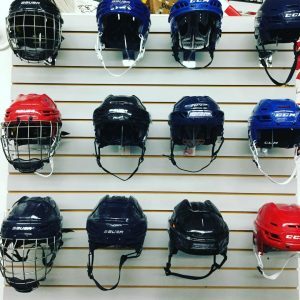 If you are looking for junior hockey helmets, then save yourself heaps of time and check out our Ultimate Junior Hockey Equipment Buying Guide for 2019. Also don’t forget to use our exclusive Hockey Monkey promo code: PROS15 which will get you 15% off all the equipment sitewide. Plus if you are in a hurry, then here is our featured recommendations which will again save you heaps of time. But you can find our more in-depth reviews further down below. So let’s dive right into it, shall we? I will go ahead and tell you right off the bat, DON’T BUY USED HELMETS. You don’t know what that helmets been through or even how old it is at times. Yes, helmets do expire. On the back of your helmet you will notice a sticker that says HECC certified, this tells you what date you helmet is set to expire. These expiration dates aren’t anytime soon as long your buying new like you should be. Let’s go ahead and look at a picture of one these pictures so you know what to look for. In a game of hockey, contact does not tend to be head-on collisions like they do in the NFL. It’s quite rare to see NHL players get taken down where their head smacks the ice. However, having done some research, I found that there were 559 concussions recorded from 1997 to 2004 or roughly 70 concussions per year. Now in 2014, there were 53 concussions recorded which I think shows the improvement of technology in the helmets over the last decade. The aim of these helmets is to reduce the force on the head a player may feel on contact. This is done by increasing the time it takes for the impact to occur. So now depending on what helmet you get will determine the level of protection you have against any collisions to your head. I’ll let you guess this one, without helmets players risk getting extreme injury’s and especially concussions. Every player needs to wear a helmet on the ice no matter what the cause. With player’s getting bigger and faster, the game has become faster and more advanced than ever. It’s not like when your pops played with wooden sticks and no helmets, no it’s on such a higher level now that helmets are a necessity. “Ok Mike we get it, you need a helmet in today’s game. How do I know which helmet is right for me though?” I’ll tell you exactly how in that in this guide! This is mostly a preference thing, or maybe you have rules against no cage. 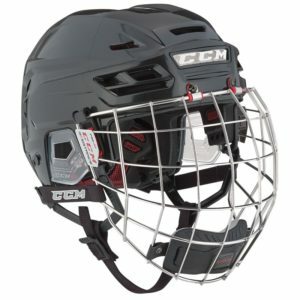 I personally prefer just wearing a visor, but my league only allows us to wear the cage. A cage is a lot safer and prevents you from getting hit in the face, but also reduces vision and weighs down the helmet. A visor obviously exposes your face a lot more but gives you way more visibility and is more comfortable. I’m not recommending you choose one or the other, again it’s all preference. We will be coming out with a review on visors and cages sometime soon so be sure to stay up to date with the sight and see that. Here’s a couple pictures that shows off the two choices we’re talking about. Now to find out the sizing, you need to take into account what type of head you have. Do you have a wide head? A small head? A big head? Haha that aside, different hockey helmets are simply made for different heads. Like CCM’s Fitlite series fits more oval shaped heads. Also another thing to watch for is making sure the helmet isn’t too big or too little. I’ve personally had this problem with a helmet being too tight and it made my head hurt after around half an hour of play. On the flip side wearing a helmet too big can be dangerous as well because it can fall off in a collision. There are great fitting systems in helmets today to prevent this, but choose wisely what helmet you end up getting. Certain helmet models fit for different head shapes, most of the time it’s not even on purpose. In this review we’ve done our research on what head type it will fit for so you don’t have to. 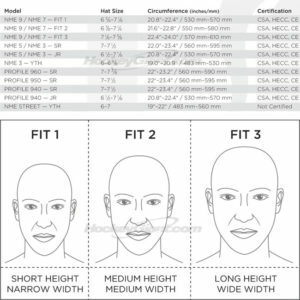 We have provided below a chart that will help with head types to make it easier as well. Bauer has supplied this nifty little chart to help show how to fit yourself to a helmet, check it out. This has made it easier sizing your head for a specific size. This also works with other brands, and then using the sizing tools the helmet comes with makes it that much easier. Several of these helmets may not be for everyone because some of them do carry a hefty price-tag. However these helmets below are good enough to make it to our list of the top 10 best helmets. And don’t forget, you can save yourself a heap of time by clicking on the helmet name which will take you down to the review without having to scroll all the way down! Now that we’ve gotten the first part out of the way, let’s get to the review! We’ve put in a lot of research in choosing what we believe are going to be the best helmets for you in 2019. We want you to have everything that will bring out the most in you on the ice, and we try to achieve this in every review we do. So enjoy the best helmets of 2019! The CCM Fitlite Hockey Helmet is continuing the great performance and results that the Reebok 11K helmet left off. There are so many amazing features in the helmet that will make you fall in love with this. The helmet is very lightweight and the protection it provides is exceptional. The fully customizable fit along with their new comfort line and the Rotation Energy Dampening R.E.D are some of the best features of the Helmet. This is a two piece construction helmet and the outer shell is going to be PE material with the subshell made of PE TG material up the top. You can also adjust the helmet as well and the newly added system allows you to expand and contract the helmet front to back. Furthermore, the helmet also has a 360 degree internal fit as well. 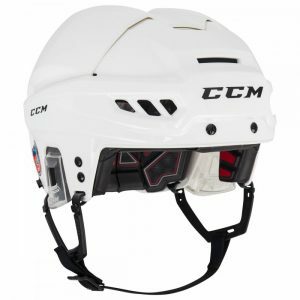 The best part about the CCM Fitlite Hockey Helmet is its customizable fit. You have the luxury to adjust it according to your needs to make sure you feel comfortable out there on the ice. The laminated lycra comfort patches are going to be another source of comfort. This grip patch that sits on your forehead is really cool as well because it helps to keep helmet in place. This helps in better protection of your head so that you can avoid injuries. Just beware that it can be a little too tight so maybe quite a squeeze for people with larger heads. If we talk about the Cage Combo then it is coming with the CCM top-line cage and the material used is titanium. This material is very strong and at the same time it is very lightweight as well so you will not feel any weight at all. Our Verdict: So, overall the CCM Fitlite Hockey Helmet is a must have and one worthy of making the top of our list. This is indeed a high level helmet that will provide you the high level protection out on the ice. I encourage you go and check them out here for current pricing because for me these are the best helmets on the market. This is Bauer’s most protective helmet ever made, 25% more protective than anything else put out on the market. The shell is a very sleek look with not too much change compared to the other models. In terms of the adjust-ability, it has this little button on the top of the helmet, which helps you expand and contract the helmet. Obviously, there is some great airflow through the front and allowing that hot moisture and air to escape out of the back. Now where we see the big changes is the liners. One of the most noticeable ones is the fit plate technology as well as the molded foam side pieces. The all-new custom fit technology with the Bauer Fit Plate is a moldable occipital lock allowing for a true custom fit for added protection and comfort. You can also pop this into the oven at home which is going to get it nice and soft which will give you a true personalized fit. There are also molded pieces that are found in the sides of the helmet which totally fills in any gaps in protection especially when the helmet is expanded. The base liner in the helmet is a real thick type of foam, a little bit of a higher density while on top of that we have a memory foam. There are moisture channels through the front of the helmet which is going to which is going to help direct the sweat away from the eyes. The new Re-Akt 200 will also take advantage of Bauer’s industry leading lightweight VTX Technology and XRD Foam to create the most innovative and comfortable liner to date. You will also notice the all-new Suspend-Tech NG Liner, which is a multi-density liner that is designed to adapt to your head shape for superior comfort, fit, and protection from any impacts in the sport. Our Verdict: Overall this is a great helmet, a very personalized fit that offers high level protection. Although the price point is quite high, it definitely looks sharp and I think worth the money. If you are interested in the helmet, you can find out pricing by clicking here. All you need in a helmet is comfort, protection, good airflow and personalized fit. If you buy the Warrior Krown PX3 Hockey Helmet you are going to get all these features in this amazing helmet. Most of the helmets out there have the two piece construction but in the Warrior Krown PX3, you will see the three piece shell construction. You can remove the side clips as well and you can make your own adjustments for the best customized fit. As you know a good helmet contains features like good airflow, comfort and protection and in my opinion Warrior Krown PX3 Hockey Helmet is the best helmet. Because it provides really good airflow as the Warrior has included a handful of gaps in the front as well as a handful down through the center. The unique single dial adjustment works really effectively and it adjusts the 4-play shell for the 360 degree fit. So, here is another reason why the Warrior Krown PX3 Hockey Helmet is super comfortable and fit. They have used the foreplay system in the liner and that certainly has taken the comfort and protection to the next level. Now as I said earlier the construction is really amazing and the same thing happened here as well. The foreplay system works really well with the traditional front to back adjustment system of the helmet. So with those two combined you will get that 360 degree fit. The foams used in the helmet are really soft, low profile and will help you get the streamlined fit and comfort. They have also used the EPP foam is very lightweight and it will not increase the overall weight of the helmet. On the other hand, this will also protect you from all the high impact shots and you will feel really safe and comfortable all the time. Our Verdict: The Krown PX3 is the new top line for Warrior and brings a lot to the table with being highly protective, light weight, and comfortable. Also this fitted my head really well because I have a relatively round head. I feel that if you have an oval shaped head, the fit may not be as snug. If you are interested in the helmet, you can find out pricing by clicking here. The CCM FL90 Helmet has some really cool features to offer. 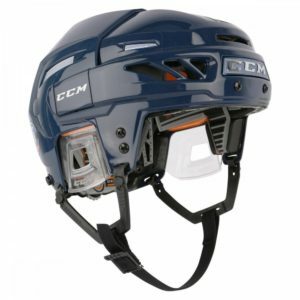 From the two-piece HDPE shell to the high density foam liner to the comfort padding to the amazing comfort and protection, the CCM FL90 Helmet has everything that you need in a helmet. The CCM Fitlite line has given you an ideal helmet and this helmet is a combination of high protection and perfect combination of lightweight. The CCM team has used the two-piece PE high density foams and it provides a really good adjustable fit. You are going to get sharp edges in it as well and the helmet will provide amazing protection and durability. The construction of the helmet is so good that it will keep you cool all the time as the air flow is very good. So, you will remain nice and cool throughout the game and the breathability is excellent. The latest CCM FL90 Helmet also comes with a nice stylish touch as you can customize it and can have a personalized look. You can contract or expand the size of it as well so the customizable adjustment is there for you thanks to their toula system. Why The CCM FL90 Helmet Is Super Protective? Well, the CCM FL 90 Helmet construction is super amazing and it will protect you both from inside and the outside as well. Internally, they have used the combination of cushioning and high density foams that will absorb all the impacts energy and you will very comfortable during the gameplay. The CCM has used the Hexagon Matrix that uses really good multi density foams as the base of their liner. So, as far as I think, this product is about the new and advanced technologies added in the helmet. This is one of the main reasons that the helmet is super protective. Like their d30 temple pads this is the most protective foam that CCM uses in any of their protective equipment. This is a rate sensitive foam and the greater the force of impact the more the molecules lock together and the greater the protection. Their signature cushioned liner is there as well to give you that top level protection and comfort. Our Verdict: So, overall the helmet is really good and you get all that for a very reasonable price. Their amazing toula sytem and their micro dial work together really great to give you that customizable and desirable fit. I think the prices are pretty neat too on Hockey Monkey and you can check them out here. So, don’t you want the top level protection and comfort? Well, the CCM Fitlite 3DS is there for you as the company has done a really great job with this product. They have used the Microdial III system which is paired with the tool-less adjustable shell allows for a snug 360 degree fit. The two piece shell used in the CCM Fitlite 3DS is really amazing as it has two shells one is outer and the other is inner. The outer shell has really high density PE and the sub shell is going to be a high density ABS. So, this construction is really great as it will give you great durability and you can use the helmet for a very long time. The tool adjustment system used in this helmet takes it to the next level as it is very useful. You can adjust the helmet as you want and you can expand or contract it the way you want to. Why The CCM Fitlite 3DS is A Perfect Match For You? So, why should you buy this helmet? Well, get one thing in mind that the helmet has everything that you need for better protection, comfort and durability. On the other hand, the helmet will provide you great airflow as there are really good air vents up through the front. The CCM team has also used the memory foam pads so overall the helmet is really comfortable and protective. The Micro Dial System – so, this is where this helmet gets really amazing and demanding. With this system you can adjust the helmet front to back and you are able to roll the dial in the helmet as well. As mentioned above, you are going to get the customizable 360 degree fit. So, with they have increased the comfort level and protection in this helmet. Now, they have also used the rate sensitive foams in the CCM Fitlite 3DS which is obviously happening for the very first time. So, it doesn’t matter if you are getting a big hit or something. It does an amazing job of absorbing the impact energy. This helmet will protect you no matter what. Our Verdict: Over all this is one hell of a helmet. Everything about this helmet says cushioning and comfort. We have even done an in-depth review on this helmet if you would like to learn more here and if you are interested in buying, check out prices here at Hockey Monkey. One thing I would say with the options would be that I wouldn’t go for the ones with silver as it was a little too shiny. But the other designs are good. Pretty awesome helmet that are comfy! The 200 version of this has already made our list and this one is a great alternative in the RE-AKT line. It has a sleek and more personalized design. The construction of the helmet is really great and it will protect you in the best way possible. Now starting with their new react shell, they have made it bearish traditional two-piece design. The helmet is super comfortable and provides really good flexibility as well. There are no two adjustments on the sides in fact they only have one central adjustment and it is very comfortable, quick and easy. The Bauer is always known for amazing comfort, breathability and airflow. If we talk about the liner, they have made some changes there and the liner it’s a free-floating liner and it is useful for all of those rotational forces. It means that will get amazing protection and the helmet will handle all the heavy attacks. For better impact management and comfort, they have used the VERTEX foam protection. So, they have definitely taken the comfort of the helmet to the next level. On the other hand, the VERTEXT foam protection is very useful in weight reduction. There is also memory foam pads used which help to level up the comfort and it is also used for a snug and it will provide you that amazing comfort and personalized fit. Well, there is no doubt that Bauer Re-Akt Hockey Helmet has so much amazing technologies. The SUSPEPND-TECH liner system the true free-floating suspension line offers enhanced protection and amazing comfort as well. They have used so many amazing technologies that has made this helmet a demanding one. From the triple density impact management protection to the dual density ear cover protection which is useful for ear protection, the Bauer has done a really great job with this product. The Poron XRD foam is super light very pliable and breathable which will dissipate all those high energy impacts. So, with all the advanced technology used in the helmet you are going to get amazing protection and high energy impact dissipation as well. 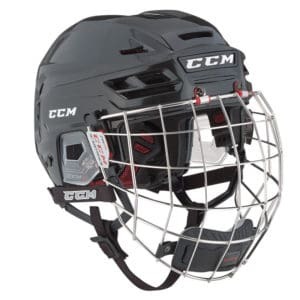 Bauer Re-Akt Hockey Helmet also comes with a cage combo as well. The MICROBAN antibacterial protection is also there for you. So, during the game you will remain fresh and dry as this will help in resisting the odors and mildew. 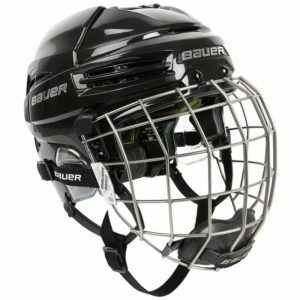 So, overall the Bauer Re-Akt Hockey Helmet is an amazing product and you are going to get almost everything in the helmet for a very reasonable price. The helmet made of one-piece design such that the shell is a continuous piece with no joint on the entire extent. 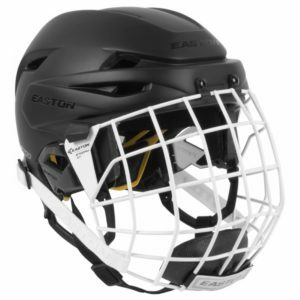 The design is similar to the Easton S19 helmet with four plastic pieces laminated into a one piece EPP form liner. The combination makes the helmet extremely rigid a resistant to forceful contraction and or breakage either laterally or longitudinally. The helmet is made extremely lightweight with full coverage on the entire extent of the head without leaving gaps in between. The result of having a one piece design that is compact and rigid enough to perform the said function.The compact design also improves the durability by having the helmet continuous from end to end and greatly resistant to mechanical damage. The liner made of a one piece EPP form loaded from end to end covering the extent of the helmet. There is removable form padding removed after using the helmet in a game when washing the helmet.They are also available online for purchase in case they wear out, or you lose them. The fit system located at the back side of the helmet that facilitates the inner adjustments of the helmet to attain the desired size and posture on the head. Made of elastic plastic which grips the back side of the head to give a comfortable feel as well as maintain the helmet in position throughout the match. The fit system is adjustable from the inside by mechanical movement means that only entail changing the attachment location on already fixed points. The custom adjustment points located both on the sides and the top back sides to enable the player to personalize the experience putting on the helmet according to his preference. The ear covers are adjustable up and down to fit the shape of the years of the player.This is the only available make in the market with a black color, but there is white color helmet too of the same type. Our Verdict: Overall this helmet is a great bang for your buck and I encourage you to check out the prices here. It’s gone sold out in many places all over the internet because it sells so well. We’ve even done an in depth review on this one and you can see it in the link here. The helmet made of a one fit shell design which does not have any joint on the outer part to give a great difference in movement from side to side inside it. Ventilated with openings at the front and rear sides located in such a way that water drips off directly without entering the openings.The adjustment features are located on the back side to make it rigid and protective. This is because the addition of internal designs on either side makes the helmet have weak points which may not attain the overall protective role besides performing the comfort function. 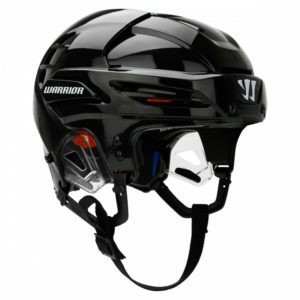 The adjustment pivots are located at the back on either side to facilitate the middle piece movement inwards and outwards to adjust the size of the helmet according to the player’s preference or even the size of the player’s head. The action controlled by an aperture that locks and unlocks the various size preferences that curve on the occipital protuberance and grip the head from inside by cupping the back of the head. The liner has an optimized design of the previous helmet designs of the same type. The primary role of the liner is to protect the head from minor injuries caused by minimal impacts on the head during the game. The impact pods have engineered a combination of EPP with a molded shock absorber to help reduce the linear accelerations caused by an impact on the side of the head. The rotation energy dampening system (RED) consists of a series of liquid-filled bladders to help reduce the rotational acceleration caused by an impact on either side of the head. The liquid-filled bladders are attached to the impact pods on the inner surface of the helmet. The layout of the two components determines the impact of a side-hit on the head by slowing down how quickly your head gets spun as a result.The comfort liner forms made of two, one medium density form and on top another thin, smooth one that breaks away the moisture keeping the head dry. The helmet is pretty deep with nice low profile fit that enables a player to sit down comfortably without appearing taller than the others. 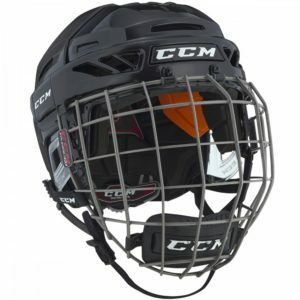 It comes with a CCM cage combo with two shock absorbers at the top that dump all vibrations in case the player is rolling or accidentally falls and steel still front design to protect direct impact on the front side of the helmet. Our Verdict: This is a great helmet for what you’re getting. It’s very light weight and CCM has done a great job with the overall build quality of this helmet. Not to mention the cushioning feels great and is very comfortable. Overall this is a fantastic helmet. Little heavy but unbelievable amount of protection! 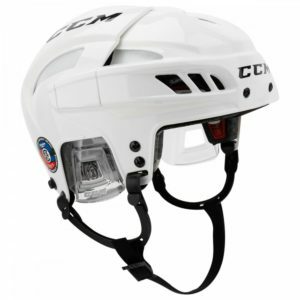 There is a newly designed shell with a single tool-free adjustment system in the CCM FL500 Senior Hockey Helmet. If you see the shell of the FL500 is as same as all the fit light line helmets. Furthermore, there is also similarity in terms of material used in the helmet. The quality of the shell is really good as the CCM team has used high density foams in the shell. With the too-free adjustment system, this helmet is a must have. As they have made things easier for the players the shell is adjustable and it has a two-piece design. You can expand and contract the helmet by using the switches on both the sides of the helmet. The ventilation of the helmet is really good too. So, you will feel cool and the hot air will be pushed out. Well, the FL500 is really protective and you will feel very safe while wearing. So, the question is why the FL500 is super protective? The main purpose of creating this helmet was to give excellent protection to the players. The CCM wanted to create the most protective helmet ever. You are going to get that top level protection with a simple tool free adjustable shell. The CCM has used the multi density VN foam liner and but don’t be fooled. This liner is way better and different from the traditional one as it is 25% thicker. So, this thickness makes the helmet super protective as it will absorb more energy impacts so all those big hits will not bother you anymore. Though the helmet is really great in so many ways but it has it limitations as well like the helmet is a bit heavy. The liner of the CCM FL500 Senior Hockey Helmet is loaded with CCM’s D30 smart material and there is I.Q Shion multi foam as well for the support. As you know already the FL500 helmet absorb the energy impacts effectively and the D30 material comes in really handy to do that job. The D30 material is designed to absorb and disperse impact. So, the players will remain safe from any kind of attack. The helmet is very comfortable as well and the Cushion Liner is used in the helmet to provide excellent comfort. Because the helmet is heavy and mega padded, you can say the helmet is designed to take the hits and absorb the impacts. So, you will feel really comfortable because of all that. Our Verdict: This is one helmet which I would suggest you try before you by if you get the chance. It;s quite different to others out there on the market. Little heavier than others but it’s also designed to take some heavy hits if not the best at it. If you are interested in picking these up then check them out there on Hockey Monkey. Insane comfort and can’t go wrong with the price point either! The Bauer 5100 Hockey Helmet is super protective and comfortable. The construction of the helmet is a bit different as this is a fairly new product by the Bauer team. They have worked extremely hard on this and I believe they have done a tremendous job with this one. So, it has around 9,500 shells and in order to provide great protection and reasonable price the Bauer team has used different materials for the construction of this helmet. 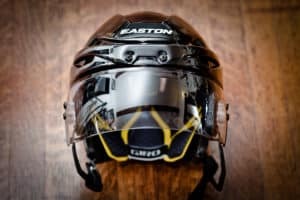 So, what are the main features that every top level and a rookie want in a helmet? Firstly protection and secondly fitting and the Bauer 5100 Hockey Helmet is giving you all these main features. So, why are they super protective? Well, the helmet has been designed for amazing protection and comfort. There are dual density liners (HX-Sorb + comfort foam) and apart from that Ergo translucent ear covers. If you further want to know the credibility of the product then just keep in mind the helmet is also certified from CSA, HECC and CE. Customizable Fit – It has a two-piece shell construction and it comes with a tool free adjustment. You can flip the sides of the helmet. You can expand it or shrink the size of it. So, you can adjust it the way you want to. For better protection and comfort the Bauer team has used triple density foam on the inside of the helmet. There are different layers and every layer has a unique purpose. 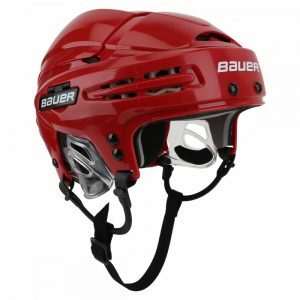 Why Choose Bauer 5100 Hockey Helmet? In order to provide additional protection, they have also used the dense foams in the form of blue kind of honeycomb material. It will also decrease the pressure and will make you stay cool all the time. In other words the airflow is pretty good. There are protective ear pieces used as well which has further increased the protection level. Our Verdict: I personally think that the product is really cool and it has some really great features to offer. The fit and comfort are of the same as some of the higher end buckets out there. Above all the helmet comes with a really good price (like this one Hockey Monkey). We hope you found this review helpful in finding a good helmet for yourself! We always try to make it as easy as possible to find the right equipment that will bring out the most of you out on the ice. Be sure to check out our last post Ice Hockey Practice Jerseys and all our other reviews to see all our cool content, thanks for visiting What All The Pros Use!